Ahmad Toure along the banks of the Potomac River. Photo by Jeff Watts. Many people loved playing outside as children, and Ahmad Toure, BSBA '09, was no exception, but for him, that passion didn't fade with age. 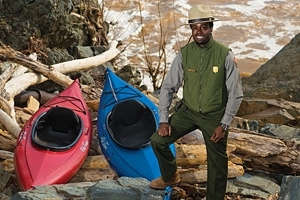 After interning for the U.S. National Park Service as an undergraduate, Toure landed a full-time job as an interpretive park ranger at Great Falls Park after graduation, and he's enjoyed every minute of it. "I've always liked being outside," said Toure, who specialized in marketing at Kogod. "If I saw an animal, I would immediately look it up and just try to learn everything I could about it. The naturalist side of me has always been there." As an interpretive park ranger, Toure guides park visitors through river trails, teaching them about the rich natural and political history of the park with unmatched enthusiasm, using it as another marketing tool. "Even though the job of an interpretive park ranger is to tell the story of the park," he said. "We're doing it in order to connect people to Great Falls and build an element of stewardship so they want to support the park and want take care of it and tell their friends about it." According to Toure, George Washington built one of the first American canals in Great Falls, which eventually led to the conception of the U.S. Constitution. Individual state sovereignty at the time meant individual states controlled the rights to everything within their boundaries and weren't obligated to share with other states. "The Potomac River is owned by Maryland, so Virginia had to make an agreement in order to use the canal, and when other states heard that, they all wanted [trade agreements] as well. They had a big meeting and that ended up being the constitutional convention," he said with unbridled eagerness. Toure decided during his senior year at Kogod he was going to use his marketing knowledge for the greater good. "Throughout my senior year my whole focus was finding work with a socially responsible organization," he said. "Luckily the Park Service gave me an offer, but I would have considered anything else that focused on social responsibility." Toure has also helped organize a youth program to help kids get in touch with nature and stay in shape. He created activity books designed to engage kids by teaching them about the park through activities like crossword puzzles, word searches, mazes, and scavenger hunts. "A lot of the activities really encourage the kids to get out and be active, move around, use their senses, and things like that, said Toure."